My name is Jonathan and I wanted to share my board for PedalLine Friday! I sing and play guitar in Heptagon, we do riffy-indie rock with some ambient moments thrown in. I play a few guitars (A Puresalem Gordo, Reverend Flatroc, & Reverend Double Agent) because we use a lot of different tunings, and everything goes through my Mesa Boogie Maverick 4×10…it sounds sort of like a beefier AC30. TC Polytune – I used a Boss TU2 for years that broke and I replaced it with this, and I love it. Easy to read on dark stages and the buffer is awesome. Xotic SP Compressor – I bought this mostly as a recording tool to get more punch out of my clean tones but I’ve been using it live for the same reason. I keep the blend about 60% and it does the trick really well. MXR Analog Chorus – I keep all my other modulation after my gain pedals, but I don’t really use chorus with overdrive so it works out well in this position. I currently have this set for a more subtle sheen, but when I want to get weird I’ll just max all the knobs out. Electroharmonix Pog 2 – This thing was a game changer for me. It’s got 8 presets and I’ve dialed in a variety of padded organ sounds, a 12 string kind of tone, and a very warbly chorus. The best thing about this (aside from the impeccable tracking) is that it plays really well with other pedals – especially my phaser and delay, so I can get some really awesome ambient vibes going. EQD Park Fuzz Sound – A solid vintage-voiced fuzz, but it can get kind of gated-sputtery sound at the right settings. Even when it’s dimed (which it usually is), it retains a lot of note definition so I tend to stack it with my other gain pedals for leads, but we have a few songs where I switch it on for big power-chord kind of moments. EQD Speaker Cranker – All the overdrive tones on our last EP came from an Orange Dual Terror with the gain halfway and this thing pushing the amp with the knob at about 2 o’clock. Because there is no EQ the low end can get a little bit muddy when you crank it – but as a rhythm/crunch sound or stacked with other pedals it’s perfect. Live, I keep the knob hovering around noon and it has the kind of saturation you get from blasting a low-wattage tube amp, just really natural and thick sounding. Pettyjohn Electronics Chime – This pedal was a bit of an investment but it’s the best/most versatile overdrive I’ve ever used. I have it set to Germanium clipping – the middle setting is a combo of Germanium and LED which sounds better for recording, but that’s part of why this pedal rules – with the three low-cut settings and clipping modes it sounds great with any amp/guitar combo. I use this for my main overdrive sound, and I stack it with the Speaker Cranker quite a bit when I want more oomph. It’s also built like a tank. EQD Hummingbird – For when you want to sound like a helicopter and/or synth. It can pull back and do more subtle Fender-like Vibratro sounds, but I tend to push it for more dramatic textures. On our song ‘Stilts for Sale’, I get a sound where I have the POG set two octaves up with attack rolled off, going through this pedal on a really choppy setting and it’s all drowned in a ton of reverb; it created this great spacey-raindrop kind of sound – this pedal really shines when you’re stacking for cool effects. I also love hitting big chords and then messing with the rate knob to make glitchy/ring-moddish sounds. EQD Grand Orbiter – Just a rad Phaser/Vibrato. I really love a long, subtle sweep, so I have the depth rolled up all the way and the rate super pulled back on the phase setting, it’s a really vocal kind of effect. Starlight Subdecay – I really, really wanted to get that jet-stream flanger sound, but I try really hard to make sure all the pedals I buy can do more than one thing. I was sold on this pretty quickly – it goes from lush chorus to jet-stream to just generally weird. Admittedly I don’t use it a ton live, but every now and then I’ll kick it on during a solo or riffy moment to get a super 80’s sound. Way Huge Supa Puss – Before this, I had the Malekko 616 delay which I loved but it didn’t have tap-tempo. The Supa Puss sounds fairly similar (both analog delays), but it’s got the tap tempo, the 4 different subdivisions, and a few other features. During that same part on ‘Stilts for Sale’, I used the chase mode – you hold down the feedback knob and it automatically starts cycling through subdivisions – and it sounds like atalking robot. I found the more pedals you have on in the chain before it the weirder/more spacey sounds you can get. EQD Ghost Echo – I clearly have an affinity for Earthquaker Devices, but this is their last pedal in the chain! It’s a spring reverb with a pre-delay and I usually keep it at fairly moderate setting, but for certain moments I’ll crank all three knobs to get a huge wash.
Dwarfcraft ARF – This was another big purchase for me, I’d never owned any type of synth/filter pedal before. I keep it set at a lo-fi sound (like an old-timey radio) and set the filter with a really slow attack and super quick release to create swells and general texture madness. This was also a big part of the ending for ‘Stilts for Sale’, there’s a sound panned to the left speaker in the last 30 seconds that sounds like a crackly siren. It’s become a bit of a staple for me whenever I do noise-jam stuff. 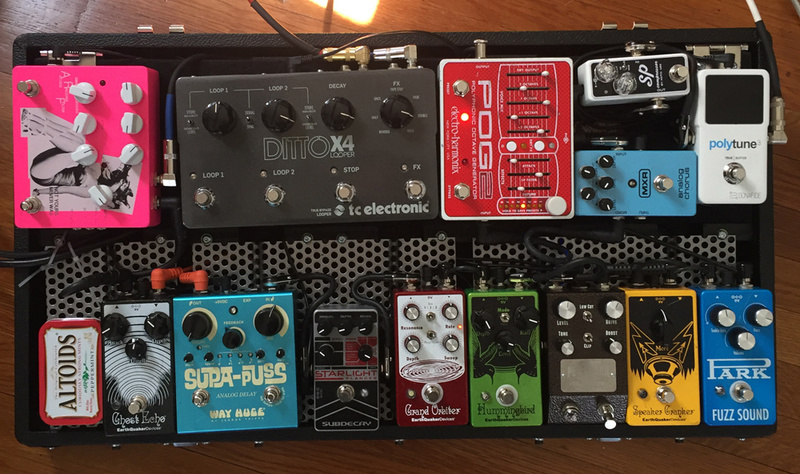 TC Electronics Ditto Looper – A few years ago I had the X2 version of this, and someone on craigslist had the X4 and wanted to size down so I got lucky and we traded. It can be a little complicated when you get into all the functions, but it’s super useful when I’m writing and trying to figure out parts. In live settings, I’ll create loops between songs while we’re tuning, but my favorite thing to do with it – I’ll layer a bunch of parts with 10 or 15-second loop, usually starting with harmonics and building it with small lead lines and chords (with a lot of reverb & delay), and then use the reverse function to create a big padded sound, and we’ll jam over that because once the loop gets that big, it sort of relieves you from having to keep time and you can just focus on the vibe.